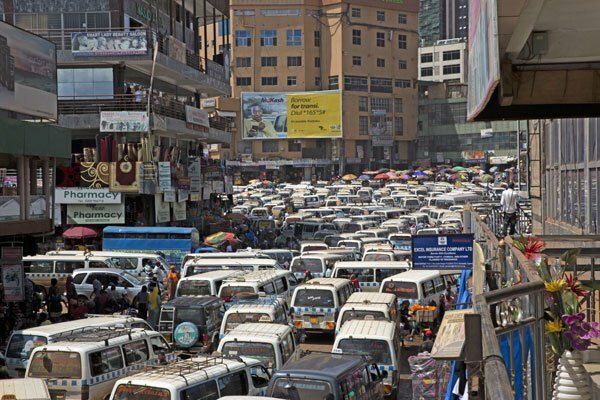 The new Multi-Modal Urban Transport Master plan for the Greater Kampala Metropolitan Area (GKMA) is set to undercut the city’s traffic jam. The new transport plan intends to phase out taxis and boda boda and replaced them with the Bus Transit System and Rail Transit system. Also, non-motorised corridors will be gazetted to cater for pedestrians. Currently, there is no non-motorised corridor in Kampala Metropolitan area. The master plan is part of the second phase of the Kampala Institutional and Infrastructural Development Project (KIIDP). KIIDP-2 is a five-year $183.7m (Shs693 billion) project funded by the World Bank and the government of Uganda is being implemented by Kampala Capital City Authority (KCCA). Overall, it seeks to improve Kampala’s road network and drainage system. Under the plan, KCCA will construct and operate a robust Mass Rapid System with buses, Light Rail Transit and cable cars by 2040. The plan, yet to be launched by KCCA, is also set to ensure an environmentally friendly transport system and promote sustainable mobility. Once implemented, KCCA says this new transport infrastructure will encourage commuters to use sustainable transport modes such as walking, cycling, and buses. The master plan that was drawn by ROM Transportation Engineering, Cambridge Systematics and TNM consultancies was undertaken between July 2016 and May 2018. Mr Jacob Byamukama, the KCCA’s deputy director for roads management, says the Multi-modal Urban Transport Master plan is in line with the Kampala physical Development Plan, which aims at creating a well-organised and modern urban metropolitan transport system. Mr Byamukama says KCCA came up with six main criteria that was used to identify the different modes of transport for GKMA, including; sustainability, mobility, accessibility, and being economically and environmentally friendly and safe. “The scenario we chose was the one which has about three major metro lines which are very fast, four light rail lines and five bus rapid lines and two suburban lines, giving us a total of 360kms of mass transit in the city that covers the whole of GKMA,” Mr Byamukama says. But he also says the plan will be implemented in five phases, namely the pilot phase (2018-2021), short-term phase (2022-2025), mid-term phase (2026-2030), long-term phase (2031-2035), and the horizon phase (2036-2035). The pilot phase includes immediate projects that are to tap into existing conditions and are relatively easy to implement. These cost-effective and critical projects include non-motorised Infrastructure such as walkways, taxi fleet renewal, control centre, traffic management and other parking policies. The short-term phase was designed to directly build on the foundations laid by the pilot phase and include the operational and maintenance investments for the projects included in it. As part of the phased concept of the master plan, this phase also includes major progress in the design-and-build parts of the bus system as well as piloting the design for heavy rail infrastructure and building of others, including two Light Rail Transit routes and one metro route. The mid-term phase focuses on three important aspects: the operation costs of the metro route and the first LRT route, the finalisation of the Bus Rail Transit build and design, and the intense buildings of the rail based MRT to create a network for the phase. The long-term phase focuses on the operation of three Light Rail Transit routes and two metro routes as well as all Bus Transit routes. It also includes the final design stages of all the remaining MRT Lastly, the horizon phase includes all operational costs as well as the finalization of the network. According to the plan, the Suburban Passenger Rail will have the eastern and western routes. The eastern route will stretch from the region of Mukono to Kampala while the western route will stretch from the region of Bujuko/Buloba to Kampala. The Metro (underground rapid transit) will have three routes. The first Metro will stretch from Namanve to Kajjansi, while the second one will stretch from Namanve to Nansana, and the third one stretching from Kajjansi to Nansana. The Light Rail Transit will have three routes. The first one will run from Busega to Port Bell, the second one from Kira to Ggaba while the third route will stretch from Ggaba to Namboole. The Bus Rail Transit will have four routes, with the first route stretching from Mukono to the Central Business District (CBD) and the second one from Entebbe to the CBD. The third route will stretch from Kawempe to the CBD while the fourth route will stretch from Kyanja to the CBD. The entire project will be funded by government and partners. Dr Amin Tamale Kiggundu, a planning expert, who also heads the architecture and city planning at Makerere University, says KCCA must first address the key issues such as improving land use before the plan is rolled out. He also says government needs to promote high density urban development because density translates into demand. Dr Kiggundu warns that it is risky and imprudent for a developing city like Kampala to focus mainly on expanding its road infrastructure, arguing that building of new roads triggers traffic gridlock. “Over 50 per cent of commuters and travellers in Kampala walk to their work stations, 10 per cent use private cars, 30 per cent use public transport and the rest of 10 per cent use bicycles. It is, therefore, important for the city managers to focus on those modes of transport that are used by the vast majority of commuters such as walking,” he says. He says metropolitan spatial planning approach is also critical in the case of Kampala in part because the majority of people working in Kampala now live outside the city’s boundaries in Mukono, Wakiso and Mpigi districts. Currently, the majority of people flock to the city centre from the metropolitan areas because there are no developed towns where they could engage in business-related activities. As such, traffic gridlock becomes inevitable. Mr Byamukama says the land use as reflected in the plan is the one which is contained in the Kampala physical development plan where they are projecting new cities in the GKMA. He says looking at the recent census, KCCA came up with a service targeting 5 million passengers per day. A recent World Bank report attributes the heavy congestion in the city and the metropolis to lack of public transport. The report says Kampala’s roads are dominated by boda bodas, private cars and taxis which are estimated to be growing at 11 per cent annually. The report shows that while boda bodas represent the largest share of vehicles in the city, they only carry few passengers in a day. On the other hand, the report adds, the informal mini-bus taxis transport carry the largest portion of people despite making up the smallest group of vehicles using the road. The report adds that a boda boda carries approximately only nine passengers out of the 42 trips daily, private cars carry only nine passengers out of 37 trips daily while taxis carry only 82 per cent out of the 21 trips, which they make daily. KCCA’s directorate of revenue collection shows that there are 14,000 taxis operating within its jurisdiction while the number of boda bodas is estimated at about 100,000. The World Bank report stresses that the lack of coordinated routes and stops for taxis as well as their capacity, means that the number of times a taxi has to stop to pick up or put-down passengers, is high hence blocking other motorists. For instance, a bus carries 60 to 65 passengers every trip while a taxi carries only 14 passengers. This means to carry 65 passengers, which one bus accommodates for only one trip, a taxi will need about five trips. For only two trips made by a bus, a taxi would require about 10 trips. Currently, Kampala roads are competed for by boda bodas, taxis, heavy trucks and lorries and other private cars, which ultimately causes traffic jam in the city. For instance, Kampala city is littered with illegal stages for taxis and boda bodas, and over 30 illegal bus parks. The uncoordinated transport in the city coupled with the narrow and potholed roads, makes traffic jam inevitable. For instance, statistics from KCCA show that out of 2100km road network for Kampala and its five divisions, only 586km are paved while the rest are unpaved. Further still, the available public transport isn’t compatible with the current city population. The 2014 Census put Kampala’s day population at 4 million and the resident population at 1.5 million. But with the ever swelling population in the city and GKMA, a reliable means of transport is needed. For instance, the World Bank report projects the population in the GKMA at 10 million residents, but the report says the current road infrastructure can’t keep pace with the soaring congestion. The existing roads in Kampala were constructed in the 1960s to accommodate only 100,000 vehicles per day. However, the report notes that at least 400,000 vehicles use Kampala roads every day. Even the Northern ring road system, which was completed in 2009, now suffers from heavy congestion. The transportation system in the GKMA is a radial, corridor-based system with a high share of non-motorised and public transportation. While the high reliance on these modes creates ideal conditions for Mass Rapid Transit (MRT), the public transportation system is predominantly composed of low capacity modes such as 15-seater taxis and Boda-bodas. According to the Travel Habit Survey which was made during the compilation of the Multimodal Urban Transport Master plan report May 2008, pedestrians account for 46 per cent, Boda-boda 17 per cent, Taxi 22 per cent, Cars 13 per cent while others constitute 2 per cent. The survey also reveals that with over 22, 0000 private cars in the GKMA, the survey results show that there are 55 vehicles for every 1,000 people in the GKMA. When compared to rates in Nairobi (42 in 2013), Dar es Salaam (25 in 2009) and Cape Town (206 in 2013), and the necessity to improve public transport is emphasised. How do hydrogen buses compare with diesel versions? Hydrogen powered buses use fuel cells that, through an electrical chemical reaction, covert hydrogen to electricity. This means that these vehicles are in fact electric vehicles and will therefore be quieter with zero emissions. Clearly this has significant environmental benefit for Aberdeen, not only in improved air quality, but potentially also in improved public health and a reduction in the effects of pollution on buildings. Learning will be shared with other regions involved in demonstration projects in hydrogen transportation. Aberdeen will have a commitment to the funders to provide timely and accurate data on the performance of the buses, testing them against their diesel equivalents and investigating the range of economic and environmental benefits that this technology can offer. Are hydrogen buses being used elsewhere or is this a new technology? Hydrogen powered buses are already successfully in use today at many locations across the globe. Some of the most notable locations include London, Hamburg, Milan, Oslo, California, Whistler, Amsterdam & Cologne. The H2 Aberdeen project will be the largest demonstration of these types of buses and will help position Aberdeen as a pioneer in the technology and renewable energy sector of the UK. 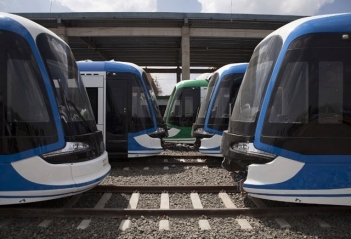 This file photo taken on April 3, 2015 shows Chinese constructed light rail trains at the Kality Depot in Addis Ababa. Addis Ababa, Ethiopia | AFP | Electric light railway tracks soar over Ethiopia’s capital Addis Ababa, a rare example of mass transit infrastructure on a continent ruled by ramshackle, diesel-spewing buses. But despite government promises, the roads below are still clogged with traffic 14 months after the light rail system’s opening, and for many residents the city’s network of overcrowded minibus taxis remain the only option. “It’s better than nothing,” said retiree Zerayakob Assefa, dismissing the half a billion dollar investment with a shrug as he waited for a train to the city’s eastern suburbs. When one did arrive, 15 minutes later, it was so packed he could not board. “I will never get on it again!” said one exasperated passenger as she squeezed from the jammed car. Opened in September 2015, the light rail was supposed to ease traffic in the capital of Africa’s second most populous country. It is the first system of its kind in sub-Saharan Africa, and has caught the attention of other cities such as Lagos and Nairobi which are planning their own traffic-reducing tramways. Ethiopian officials have touted the two-line, 34-kilometre system as a sign of the dividends the country’s rapid economic growth is paying to its people. One of the continent’s best-performing economies, Ethiopia grew by nearly 10 percent in 2015, according to the World Bank. But growth is expected to slow due to a drought and a recent series of anti-government demonstrations that have targeted foreign businesses. That has not stopped Prime Minister Hailemariam Desalegn’s administration from ploughing money into Chinese-built infrastructure projects including dams, airport terminals and highways. The light railway was built by the China Railway Engineering Corporation (CREC) at a cost of $475 million (447 million euros), 85 percent of which was covered by China’s Export-Import Bank. Excited commuters queued for hours to be the first to ride the tramway when it opened but now say it is not the transportation game-changer they had hoped for. With ticket prices from $0.10 to $0.30, the train is comparable to the cost of a bus ride but the light rail is overcrowded and the network reaches only certain neighbourhoods, commuters said. Many in the city of four million are left with no choice but to rely on the “blue donkeys”, as Addis Ababa’s cramped minibuses are known. Some even blamed the light railway for increasing traffic. While the tracks are elevated in parts of town, in others they cut between and through lanes of traffic, leaving thoroughfares snarled with cars, complained minibus driver Amin Ansar. “Even in the places where the rails are located, it’s made traffic worse, because you can’t cross to the other side,” Ansar said. Awoke Mulu, a spokesman for the Addis Ababa Light Rail Transit Service, said the trains have already carried 50 million passengers and made a “positive impact” on their commute but that the city’s large and rapidly growing population makes the job difficult. “We cannot say we are eliminating the transport problem, because the number of people in the city is increasing,” Mulu said. Wear and tear is also taking its toll with around a third of the 41 light rail cars out of action and undergoing repairs, exacerbating delays and overcrowding. Elias Kassa, a professor of railway science at the Norwegian University of Science and Technology, said planners had failed to integrate the new light rail with the pre-existing bus system. Whether rail or bus, commuters have to walk long distances and scramble across busy roads to catch public transport, a flaw Kassa warned could ultimately undermine the network if not corrected. Still, he called the system a good start for a growing city trying to keep up with its transport needs. Ethiopia has officially opened a railway line, linking its capital Addis Ababa with neighbouring Djibouti's capital. The railway line, built at a cost of $4bn (£3bn) and stretching for about 750km (460 miles), will give landlocked Ethiopia easier access to the port in Djibouti city. This railway line will greatly reduce the travel time between the two countries and will contribute to the development of Ethiopia's hinterland. It is an electrified system and environmentally friendly. This is what makes it different from other railway projects in Africa." We manage one of the largest bus networks in the world, with around 8,500 vehicles in the fleet. Our subsidiary company, London Bus Services Ltd, plans routes, specifies service levels and monitors service quality. It is also responsible for 50 bus stations and 19,500 bus stops. Read more about the bus service tender process. A small number of bus services in London are run commercially and are not part of our competitive tender process. Instead, operators interested in running this type of service need to apply for a London Service Permit. Most of our buses in London are run by private operators which have been awarded a contract by us. The contract is then managed by London Bus Services Ltd.
We operate a system called iBus on all London Buses. Using a combination of technologies including satellite tracking, iBus can pinpoint the location of buses, relaying information between the driver, garage and central control point. Countdown (live bus arrival information via signs at bus stops) is available at around 2,500 stops. In addition, real-time bus information is available online, using a web-enabled smartphone and via SMS for all bus stops. Our interactive bus maps allow people to search by postcode, street name, route number or place of interest. We are well on our way to having Europe's largest fleet of hybrid buses. These vehicles use a combination of an ordinary diesel engine and an electric motor and reduce emissions of local pollutants and CO2 by 30% compared to conventional buses. We have also introduced hydrogen fuel cell single deck buses onto Route RV1, operating between Covent Garden and Tower Hill, in 2011. The only emission from these buses is water. The first New Routemaster entered service in February 2012. The Routemaster-inspired double-decker has three entrances and two staircases to allow more people to get on and off at bus stops and is 40% more fuel efficient than a conventional bus.